I love a bit of glass, particularly when it shows the city spread out like this. Believed to have been taken in 1890 this is a magic lantern slide. It appear to have been taken from St James Hill. You’d probably struggle to replicate the shot now due to the amount of tree growth there is along the ridge to the fore of the ridge at the front of Pockthorpe and along the River Wensum. It appears to have been captured on a summer day, probably an afternoon looking at the westward shadows. 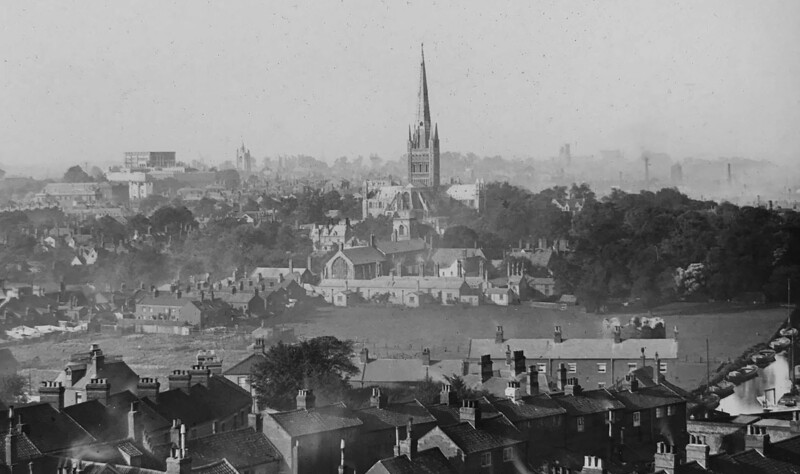 It’s nice though, familar and yet not, the landmarks of the Castle, St Peter Mancroft and Norwich Cathedral, to the rear St Laurence on Westwick Street with it’s enlarged pinnacle on the river terrace and St Giles perched up on the heights near the old old city gate, where the ringroad will one day stutter past. Cow Tower peeks over the edge of the houses on the edge of Cowholme tucked into the curve of the river. What is most remarkable, is glimpsed in the distant mists by the river in Coslany are the brewery chimneys, the last of which at Bullards came down in 1982, the industrial past around Wincarnis and into Heigham. 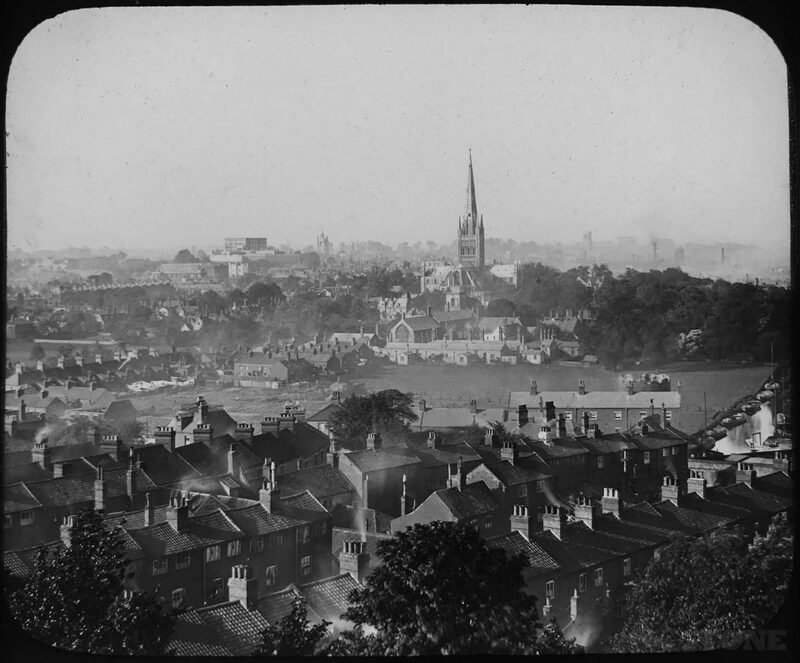 Also notable by its absence of both the Roman Catholic cathedral on the far skyline, and more striking the tower of City Hall, something which has stood since the 1930s doesn’t yet exist, not even a dream in the old Tudor, Regency and Victorian courts, yards, backstreets and passages of the Mancroft area of the city.